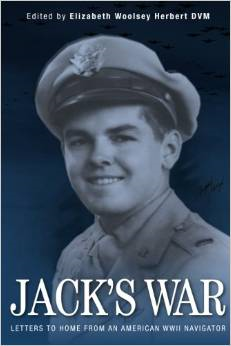 Jack Woolsey enlisted at the age of 19 in the Army Air Corps and flew 35 missions over Germany as a Liberator navigator. He survived and became a member of the Lucky Bastards Club. He wrote weekly letters to his family from the time he left California through his basic and navigational training in Texas and Idaho, and continued the letters from his base near Norwich in the UK while he flew his mission. His father saved all the original letters and actual mission maps and mission statements in albums that became known to Jack’s family shortly before his death. The transposed letters reflect a young man’s real experiences and transition though the war. There is no enhancement or editing of this collection of letters and photographs. This makes this collection historically significant. True WWII enthusiasts will appreciate the significance. Jack’s letters during basic and navigational training are rare. Before he died, he read The Wild Blue: The Men and Boys Who Flew the B-24s Over Germany 1944-45 by Stephen Ambrose. He said that book truly reflected his experience of military life. The letters support this sentiment. This is a must read for historians and descendants of WWII Liberator crewmen. This is how some of the “greatest generation” became a powerful fighting force.